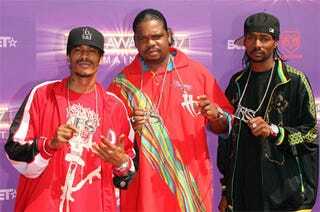 Oh, it wasn't all fashion (Bone Thugs N') Harmony at last night's BET Awards. While some of the designs on display were models of restrained femininity, others were... well, less so. Image gallery and snap sartorial judgments — plus random white dude — after the jump. Pretty ladies! From left to right: Former 'America's Next Top Model' winner Eva Pigford, American Idol winner Jordin Sparks, and chartbuster Rihanna. Too leopardy, too short, too tight. From left to right: Eve, Ciara, Jennifer Hudson.